Gudi padwa is the first holy festival which marks the beginning of the new year, new month and new day for the Hindus falls on Chaitra Shukla Pratipada. The Gudi is a flag symbolising victory, is hoisted in every houses .Houses are decorated with Mango Leaves and Rangoli and everyone in the family wear new clothes and celebrate the festival by wishing each other New year greetings. The eating of a specific mixture called Bevu-Bella (Neem and Jaggery) in Kannada, symbolizes the fact that life is a mixture of good and bad, Happiness and Sorrow. Jaggery signifies happiness and neem signifies sadness. Eating Neem and Sweet Jaggery means one need to take both Good and Bad or Happiness and Sorrow should be accepted together and with equanimity through the New Year. Coming to the recipe. 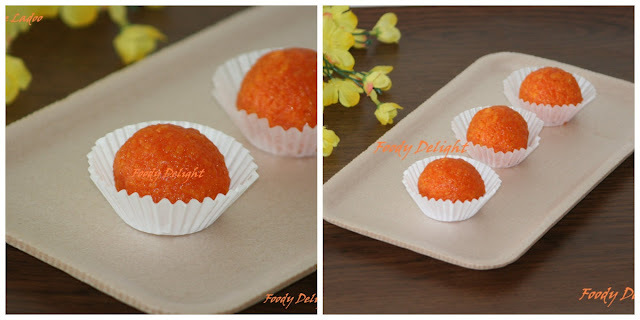 Motichoor Ladoo are ladoo made with very small sized boondi. 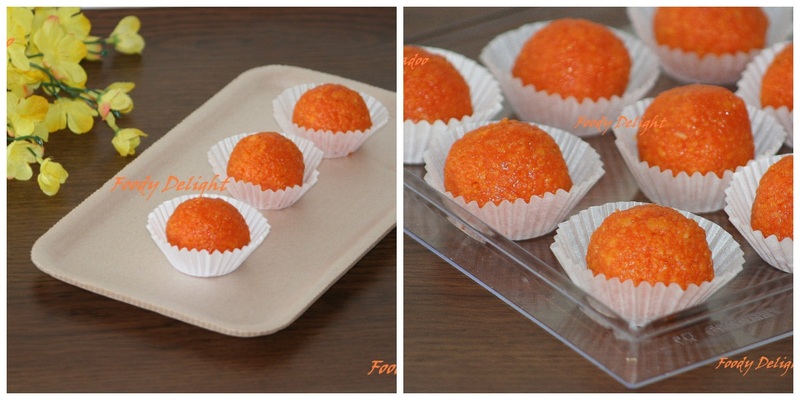 The difference between motichoor and boondi ladoo is that the boondis in the motichoor ladoo are small and pearly. Combine the besan and and about ¾ cup of water and mix well to make a smooth batter. Keep aside. Combine the sugar and 1½ cups of water into pot and heat while stirring continuously till the sugar dissolves. Heat oil in a kadhai. When hot, hold a perforated spoon (boondi jhara) over the hot oil and pour a little boondi batter at a time using a ladle over the perforated spoon. Spread the batter with the back of a spoon so that the boondi falls into the oil. Fry the boondis over a high flame to a light golden colour, taking care to ensure that they are not very crisp. Repeat the process of making the boondis with the remaining batter and immerse them in the sugar syrup immediately after frying. Allow the mixture to cool completely. Add the saffron strands, chopped almonds, powdered cardamom and rose water and mix well. Shape the mixture to make ladoo . Incredible and terrific laddoos,cant resist. Luv d color..so bright..Perfect..gud job!! !